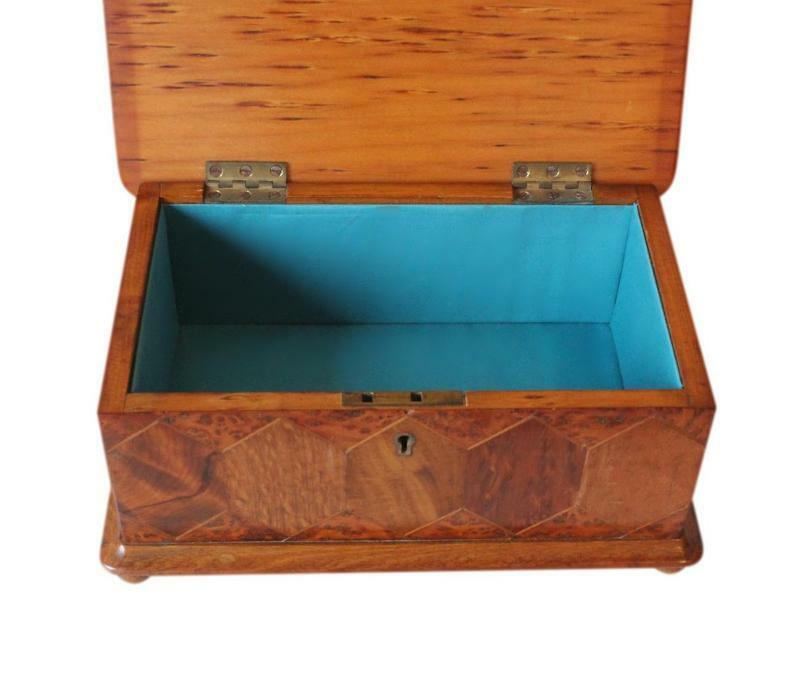 This is a fabulous vintage jewellery box with stunning exotic wood marquetry inlay. It dates to the 1930s and has a beautiful refurbished interior. 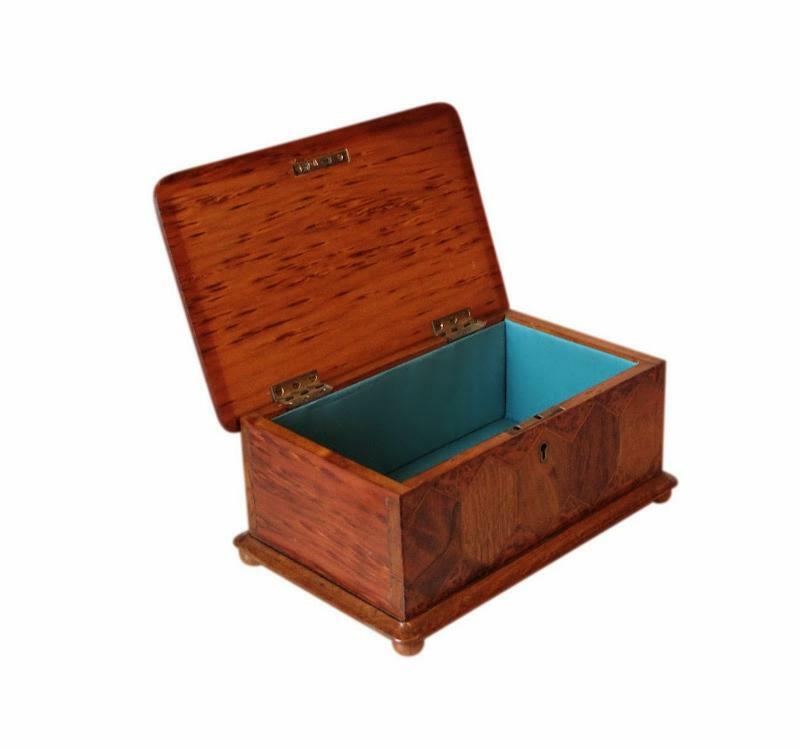 This box is made of both solid Oak and Pine and has a myriad of stunning exotic wood veneer and inlay. 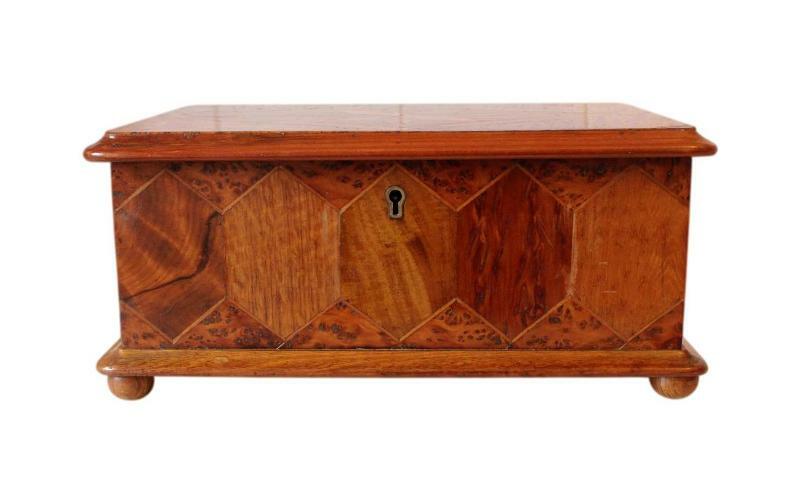 The veneer and marquetry inlay consists of Burr Thuya, Beech, Maple, Mahogany, Snakewood, Boxwood, Zebrano Wood and others! 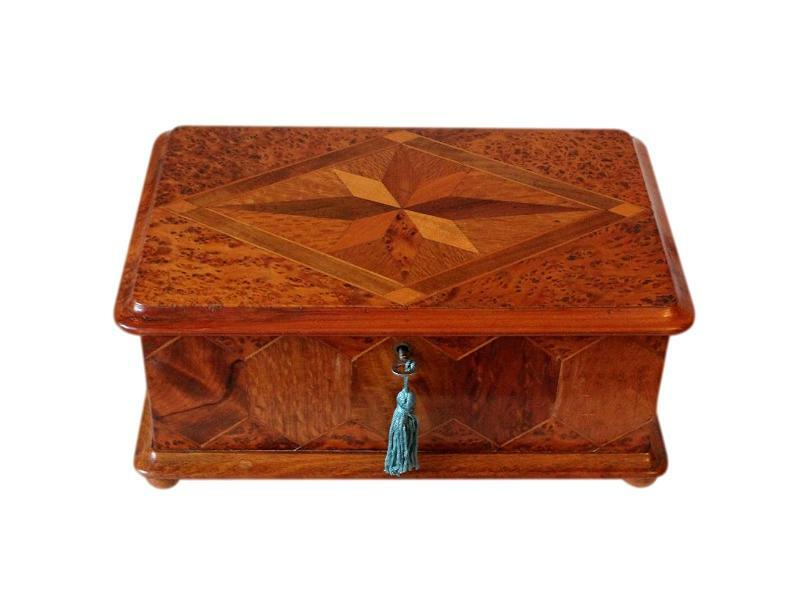 The marquetry on the lid features a large diamond frame with a large central star. The marquetry to the front has a stunning honeycomb design. The marquetry is made up of numerous, beautifully shaped, pieces of wood. There is a lovely inset brass escutcheon to the keyhole and the box is complete with its original solid brass hinges, lock and key. The box stands slightly raised on its original squat bun feet, and has beautiful dovetail joints. 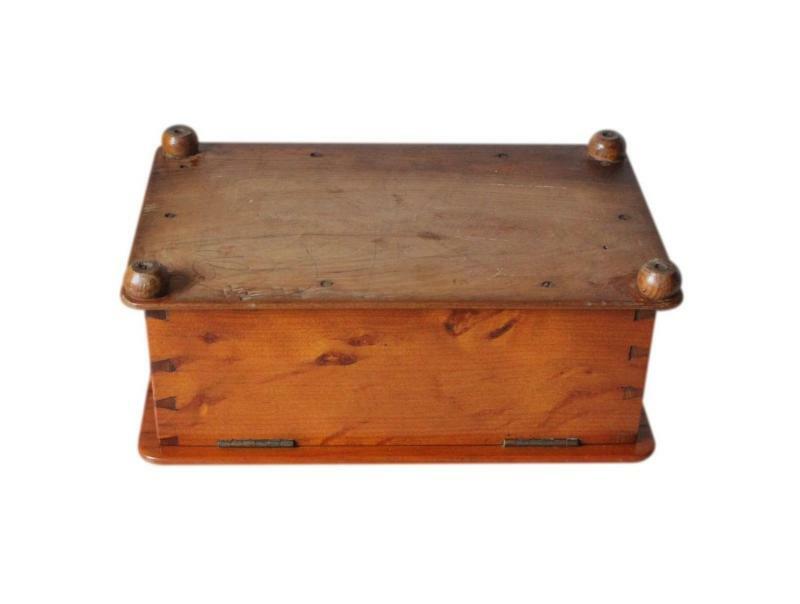 The box has beautiful moulded edges and rounded corners. 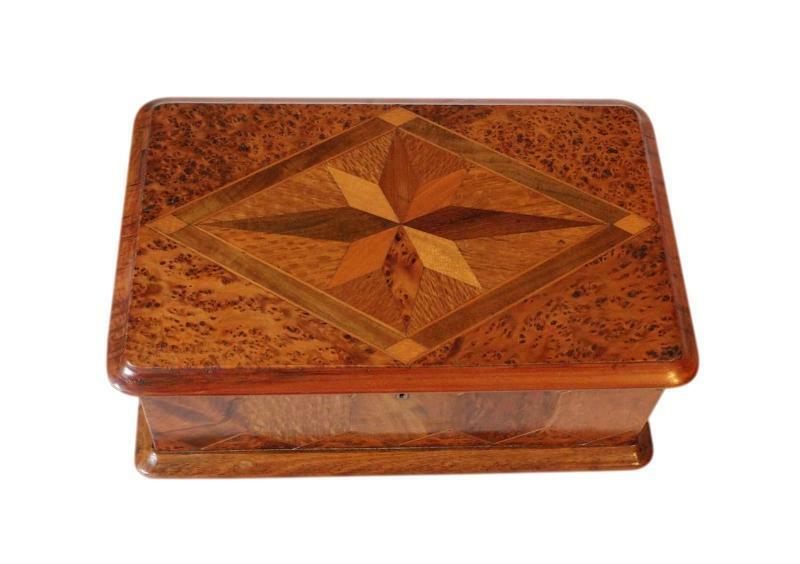 This is a fabulous high quality skilfully made box and we've never seen another one with the same marquetry decoration. The interior has a deep spacious compartment which has been beautifully refurbished by our skilled box restorer. It has a new padded satin panel in the base and new satin linings to the walls. The satin is a beautiful deep turquoise blue shade. The compartment is a generous size, roomy and deep enough to store large pieces of jewellery such as wide bangles, watches and beads. Please see the measurements given below. This fabulous box is in extremely good condition. It is structurally sound and has only minor light age related wear. The wear is mainly on the honeycomb marquetry and is in no way unsightly. All of the inlay and veneer is present and the box locks securely. The interior silk, being new, is in pristine clean unused condition. We would like to make you aware that vintage locks can suddenly malfunction at any time. They are already very old and will naturally have some wear from age and use. We are not responsible for locks that malfunction from further age and use once boxes are purchased. The lock will be checked again prior to shipping but please ensure it is still working as soon as you receive your box. 23.0 by 12.8cm with an 8.2cm depth. International Postage is by Royal Mail International Tracked and/or Signed For postage OR Parcelforce Global Priority postage. The service we will use will depend on the packed size and weight. Delivery is fast, within 3-5 working days to Europe and 5-7 working days to the rest of the world.